Equipped with a 29 1/4 in. blade constructed from steel and featuring an aged finish on both the blade and fittings. The wire wrapped handle is accented with cast metal alloy guard and pommel. 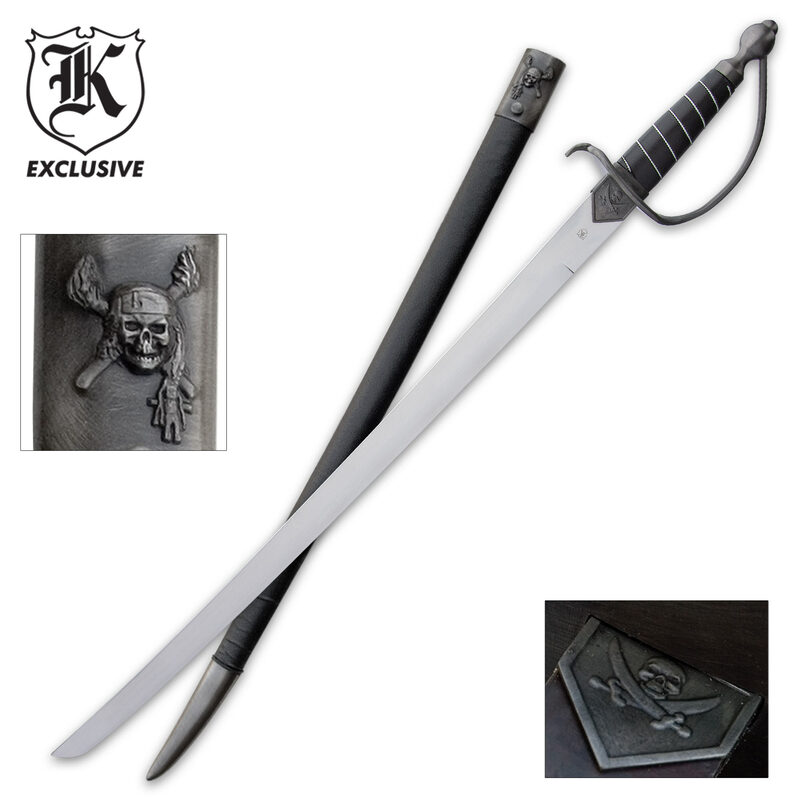 The wooden scabbard features a cast metal throat with pirate emblem and faux leather covering. 38 in. overall. Bought this sword a few years back for a pirate outfit. The rest of my outfit ended up looking like a cheap Halloween costume, but the sword was nice. It's got a nice heft to it, and the blade fits into the pommel nice & tight. The metal parts are that cheap cast pot metal, but what do you expect for $30? The scabbard is wooden with a thin pleather covering. The first time I wore mine to the ren-faire, the scabbard got scuffed up pretty good. I ended up wrapping the scuffed parts in a dark brown leather, and the end result was an even better-looking scabbard. The metal will probably hold an edge, but sharpening it would mess up the dark "damascus" patina on the blade. Then again, a well-done shiny edge would stand out and might be an improvement - just make sure you know what you're doing and don't end up with a messy-looking edge. On the outside it really does look authentic but when i pulled it out it looks like someone took a block of iron and filed it down in the catalog the blade was true it looked like an actual authentic cutlass....the one I got did not I'll just leave this one its sheath from now on. Response: We're sorry you were disappointed in your purchase. You can return the item if you are not 100% satisfied. We will check the inventory of our warehouse to ensure this is not a reoccurring problem. Thank you for your purchase! Handle busted off of mine. The "tang" is just a bolt tack welded onto the blade, unfortunately their welder wasn't very good. I was able to fix it after a quick trip to find a bolt long enough, and slender enough to fit into the handle (And then another trip to get a deep socket) Looks great, perfect asa wallhanger if the handle doesn't beak off. I absolutely love this sword! The shipping was really quick and the price was great. It's just like the swords from pirates films except so much better when you can actually hold it. I've hardly put it down since it arrived. Well built, solid. Dont care for the K logo and the "China" written in bright white, but a quick spritz of krylon made that disappear from the base of the blade. handle is comfortable. everything seems like its a decent sword. Blade is not sharpened, tip is however, very pointy. the sheath is solid wood, good locking/retention of the sword once inside, easily slides between your pant and belt and stays in place. the sheath is wrapped in a, i wanna say, fake leather which does tend to slide/wrinkle a bit. a minor irk, but other than that anoverall good sword for costume, display, or fun. 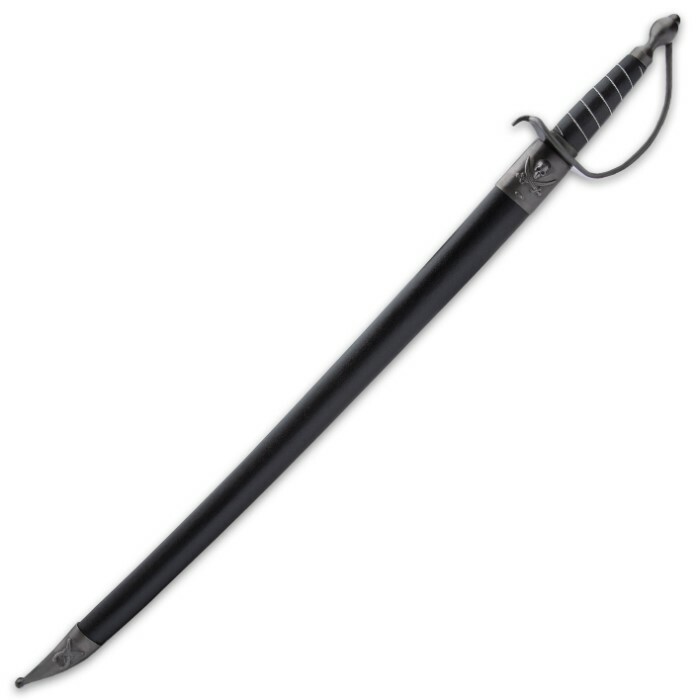 Have not attempted any actual combat/striking/blows with the sword; clashed blades once, lightly, with the wifes sword, other than that not really. i dont expect to do any actual pirating with it; however id be willing to try it in a fight if i had to. Btw, I'm 43 and didn't buy this to swing around and chop stuff up. Bought for the visual aspect. These are awesome. I installed them in a pirate skull sword holder purchased from another company. The set is so cool I hung it above my front door. This is an amazing show piece if you enjoy pirate stuff. It is not sharp at all which is a downer but I was not expecting it to be sharp. The first couple times in and out of the sheath are hard but after that it fits and comes out perfectly. And Fast shipping was awesome had it in 2 days along with a few other blades and things. I will be buying from this site again I am very happy with the service and the product. nice sword, beautifully made. my only complaint is the scabbard, the one i got has too much of the plastic covering so it bulges up near the end. aside from that its nicely built and the aged look is a nice touch. Great sword! Honestly to long to be an authentic pirate sword but still its beautiful. It is really a 4 1/2 but i gave it a 5 because the blade is a little loose. But besides that its great!!!!! Oh and it came the exact day that was specified.